Ally Blines discusses her Toyshop- Let the Children Play, what drove her to open the store and the growth it has experienced ever since. Let the Children Play Toyshop is a unique and independently owned local toyshop which I established out of desire to bring something different to Mackay. Why toys? Because I really didn’t like toyshops! After travelling through the USA and Europe with a young family of three for 6 months in 2008, I discovered that it was possible to find toyshops that didn’t smell of toxic plastic, had interesting, fresh things to look at and offered toys that were quality made and had real play and educational value – toys that I wanted to sit and play with alongside my children. At the same time, one of my children became quite ill and missed a number of years of school. The need to support their health meant giving up my career as a teacher and Head of Department of English. It also provided the time to research the industry and prepare a business plan. Setting up and running a toyshop has proven to be amazing for recovery after a traumatic series of health episodes and life changes. The toyshop celebrated its fifth birthday in September 2018 and we are proudly located in the Mackay City Centre. With strong local support from our community and my addiction to adding new brands and interesting products, we rapidly outgrew our space and began the surprisingly difficult task of finding a new site in the City Centre. Although, there are generally speaking a high number of vacant retail sites in the City Centre, they are mostly grouped around certain strips that didn’t suit my needs. It proved difficult to find a new site because we really liked our location which attracts good occupancy due to the 2 hour parking and mix of restaurants, service and retail shops. There is a lower vacancy rate in this area and nothing was available with the approx 300m2 that we required. Early last year, the Whitsunday Hotel was purchased by a local family and with them we set about marking out a suitable space that would meet our needs. Despite long delays in the complex redevelopment of the site, it has been exciting to be part of this revitalisation of one of the City Centre’s landmark buildings and we undertook the big move between Christmas and New Year reopening in the second week of January 2019. We look forward to welcoming new businesses alongside us in the coming months. We chose to locate the store in a traditional street setting as opposed to a shopping centre as it offers me the chance to have more floor space at a more competitive rate but more importantly it allows me the freedom to run my business in a more old-fashioned manner – helping the customer out to their car, providing room for children to play, holding activities and events in-store for example. It also gives me control over my business hours so we can open late nights and on Sundays for events and during the lead up to Christmas. As a small family business however, I am not forced to open during the quiet unseasonal periods. Our greatest obstacle is combating the trend to online buying. It is very frustrating when someone comes in and says that they just bought the same item online and paid for freight without having first checked to see if it is available locally. Our prices are always at or below RRP with no added freight except on some of our larger swing sets and sandpits. We have an online store integrated with our retail store and send our products all over Australia. Local customers can choose store pick up option – a trend which is helping us to blend the convenience of online shopping with the benefits of shopping locally. Recently one of our key suppliers stated that they regard Let the Children Play as one of the most innovative and proactive toyshop in the country. 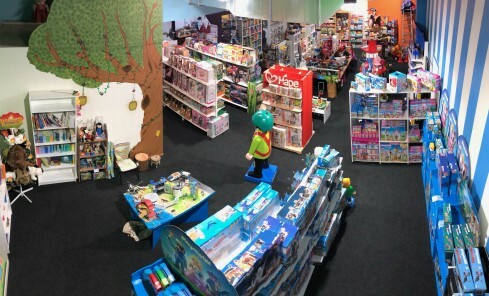 This innovation in trading methods which includes active participation in the community, a high level of social media interaction and holding in-store activities and workshops which provide a real experience for the consumer, is the reason that we have continued to grow while many toyshops and indeed retail stores of all kind are closing down across the country. We have done some hard years during the mining downturn and have had to do some hard and fast learning. At times I didn’t think we would survive but here we are in our new City Centre store strong and ready for change! I look forward to servicing our community in the changing years ahead.